Thailand is in the part of the world known for great spices, and their cinnamon is as good as any. Our cinnamon sticks are packed by the finest spice company in Thailand, at a price which is a much better deal than what you'll find in supermarkets. 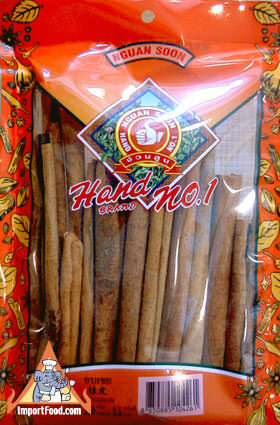 Cinnamon is one of the key ingredients in Chinese 5 Spice. Net weight of each pack is 3.5 oz, approx 25 sticks and they are longer than what you might expect (about 6" long). The February 2010 issue of Food & Wine (an excellent magazine!) featured this as a "Healing Recipe To Fight Pain and Panic" It uses so many of the ingredients we offer, so we demonstrate it for you here. We did modify it a bit--the original recipe calls for only salt and pepper to taste, we changed that to a combination of fish sauce, soy sauce and sugar as listed below. The soup tastes spicy, rich, fills your stomach and clears your mind. A real winner.